A unique summer experience in Florence, Italy designed for students with a desire to learn ancient Greek. Here, in the birthplace of Renaissance humanism where the study of ancient Greek flourished, we make the Classics come alive through the interplay of language, philosophy, mythology and art history. Calder Classics invites high school students to learn ancient Greek with us in Florence this summer. Over the course of a two-week program, the Classics come alive through the study of ancient Greek, the exploration of philosophy and classical mythology in Renaissance and modern art, and an immersion in modern Florentine life. Based in the Oltrarno and immersed in an atmosphere shaped by the rebirth of classical Greek studies in Florence, students spend their days learning Greek grammar and vocabulary and reading the great authors of Greek literature in translation. We discover many of the well-known and hidden treasures of Florence and surrounding cities. The evenings feature Italy's wonderful cultural, leisure and culinary offerings. One free day is scheduled per week for students who choose to experience Florence on their own (with advance parental permission), or rest at the villa. Beginner to advanced beginner students dedicate a morning and/or an afternoon session each day to learning the basics of the ancient Greek language—including noun, adjective and participle declensions, verbs forms and other parts of speech, as well as the basics of Greek syntax. Those with some experience in the language can enjoy portions of the course as a review. We use Greek, An Intensive Course by Hardy Hansen and Gerald M. Quinn, a textbook designed to help students acquire an ability to read and appreciate the great works of Greek literature as quickly as possible. While emphasizing the fundamentals of the language, the Introduction to Ancient Greek course integrates the study of unadapted prose and poetry. We introduce such authors as Homer, Plato and Aristotle. 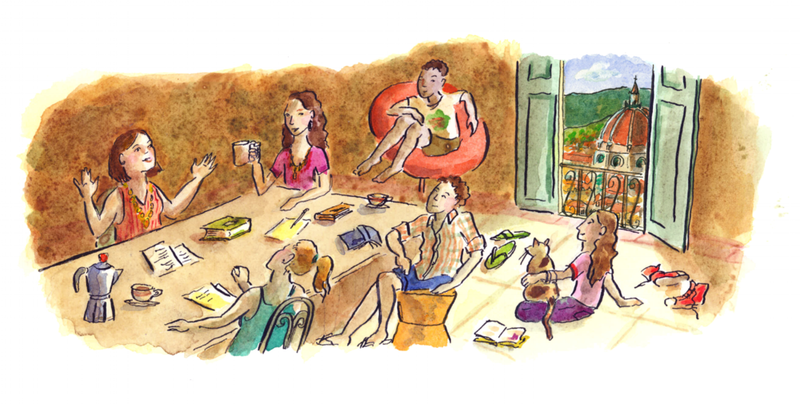 Clustered in small groups, our Greek students have an opportunity to advance their skills quickly through the intensive personal attention of Johanna Braff, a Greek teacher during the school year at The Dalton School. Located in the heart of the Italian Renaissance, our students have the perfect opportunity to understand how the literal “rebirth” of classical Greek thought and culture was experienced in 14th-16th century Italy. After reading and discussing various ancient works from Plato in translation, we look at how Plato influenced Renaissance thinkers and artists. Our study of Plato is beautifully visualized in the canvas of Florence where the artistic expression of such local masters as Michelangelo depicted Neoplatonic ideas. Throughout the program, we introduce ancient Greek mythology with an emphasis on themes that captivated the Renaissance, as well as more contemporary, Italian artists. The Greek myths come to life in the magnificent artwork of the Renaissance masters found throughout Florence allowing students to fuse their readings with visual representations. We explore these interpretive works in local museums, monasteries and public spaces. Students will take in the visual delights of Florence with their newfound Greek learning, which is guaranteed to enhance their experience and deepen their appreciation of the beautiful history of this wondrous city. Highlights of the program may include day trips to nearby places of interest such as Fiesole or Siena. 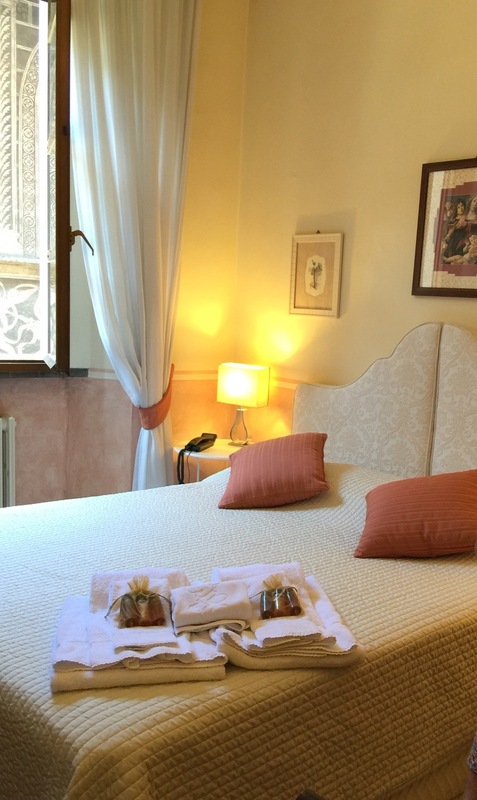 We stay in a palazzo situated directly on the banks of the Arno River in the heart of the residential Oltrarno district of Florence . Living in the heart of this culturally-rich neighborhood provides us with an intimate view of the creative talents that carry on centuries' worth of Florentine traditions from bookbinders and sculptors to metalworkers and gold-gilders. Flooded with light and color, our residence is accessible from via Santo Spirito, one of the chicest streets in the district. Inside, we have our own dedicated floor and classroom/library where we hold classes, study or just relax, along with a common kitchen and lounge. All rooms accommodate 2 to 4 students. There is air conditioning and Internet service.